The Leader of Wandsworth Council, Cllr Govindia was joined by Councillor Jane Cooper Chairman of the Housing and Regeneration Scrutiny Committee, Managing Director of Wates Residential, Paul Nicholls and representatives from the national developer’s construction team on Wednesday at Stag House to break ground at its new £7m housing development. Wates Residential was selected by the Council last year following a competitive tender process and has been undertaking preparatory works on the site since August 2018. The ceremony marked the beginning of the site’s main construction phase, with completion of the scheme due in Spring 2020. The scheme is set to deliver 21 new homes on the Putney Vale Estate as part of the London Borough of Wandsworth’s commitment to deliver new housing for Wandsworth People. The Stag House site was previously occupied by the vacant Stag House Community Youth Centre which was replaced as the Estate’s dedicated community facility by the refurbished Newlands Hall in 2011. The site will now be redeveloped to provide 10 self-contained homes for those with physical and learning disabilities, including accommodation for an on-site support officer. The remaining 11 homes will be made available for residents who wish to downsize which will free up their homes for other households in need of social rent housing. All homes will meet the latest design and homes for life standards and will be highly energy efficient and meet the latest safety standards. Speaking at the event, Leader of the Council Ravi Govindia said: “This is a demonstration of our commitment to build new homes which meet the diverse needs of our residents. Good quality housing is fundamental in supporting the wellbeing of our residents and we’re delighted to be partnering with Wates Residential on this scheme. I am also proud that this scheme is the first Council build supported housing scheme for our more vulnerable residents which will give those with learning and physical disabilities the opportunity to live safely in a scheme built to the highest standards. The new Stag House development is part of Wandsworth Borough Council’s supported housing programme which has seen five such developments providing 43 homes built so far in the borough since 2009.The aim is to enable independent living, in high quality, wheelchair-accessible accommodation within Wandsworth, instead of having to place residents in residential care which can be outside of the borough. Paul Nicholls, Managing Director of Wates Residential, said: “It is great to see local authorities like Wandsworth building again on brownfield sites and to be a part of this. Today’s ground breaking event marks an exciting milestone in our delivery of these new homes for Wandsworth residents. It follows months of collaboration with the Council, members of the community and other local stakeholders to really understand their vision for the area and how we can realise this, both through the design and construction of these homes and by looking at ways that we can create wider local economic and social value. The scheme promises to not only deliver crucial housing, but also wider benefits for local people. 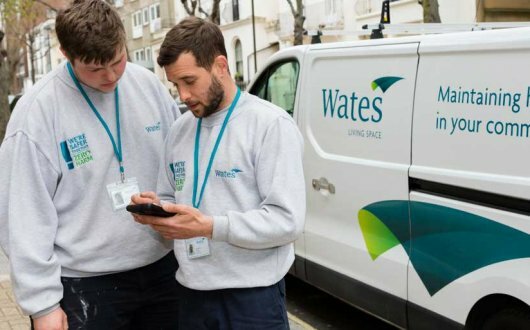 Wates Residential and Wandsworth Council have made a joint pledge to provide employment and training opportunities for local residents, including on-site apprenticeships, work experience placements and structured training programmes.